This is even better the following day, after the juices have settled in. Good cold, too! I'm back from 10 days in Italy, inspired to do something more than just grill my salmon in garlic salt and douse with lemon juice. Don't get too excited, I am not aspiring to be a chef, I just want to try my hand at giving my food a little easy, extra flavor. This recipe is very simple and delicious. Honey Garlic Butter Salmon is ready in under 20 minutes, then broiled, or grilled, for that extra golden, crispy and caramelized finish. Most of the time it is cooking so there is plenty of time to set the table and toss a salad while you wait to place it under the broiler for a couple of minutes before serving. This recipe is for 2 1/2 pounds of fresh salmon, Since I only purchased one pound, I made the sauce in a microwave dish by estimating smaller ingredient amounts. Heat up on low or defrost, not on high or you may get a lot of smoke. Trust me. Honey Garlic Butter salmon calls for basic ingredients we all should already have. 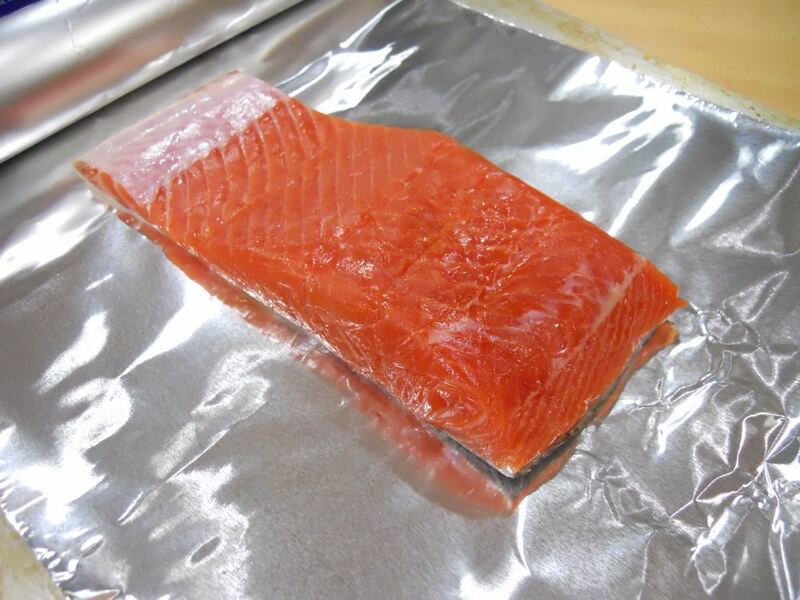 So easy, add your salmon to aluminum foil that can cover the whole slab. Position a rack in the middle of the oven. Preheat oven to 375°F | 190°C. Line a baking tray or baking sheet with a large piece of foil, big enough to fold over and seal to create a packet or 2 long pieces of foil over lapping each other lengthways to create your salmon packet, depending on the width of you fillet. If your fillet is uneven, slice it to even-width pieces so it will all cook evenly. Add the butter, honey and garlic mixture to the salmon and make sure it's well coated. 4. Place the salmon onto lined baking tray and cookie sheet. Pour the butter and honey mixture over the salmon, and using a pastry brush or spoon, spread evenly over the salmon. Sprinkle with a good amount of salt, about 2 teaspoons, and cracked pepper. Fold the sides of the foil over the salmon to cover and completely seal the packet closed so the butter does not leak. Fold the salmon and mixture tightly-sealed in the aluminum foil to seal in flavor as it bakes. 5. Bake until cooked through, about 15-18 minutes, depending on the thickness of your fish and your preference of doneness. 6. Open the foil, being careful of any escaping steam, and grill or broil for 2-3 minutes on medium heat to caramelize the top. 7. Garnish with fresh parsley and serve immediately with lemon slices. Excellent served warm or cold or for any of the four seasons in the year. Really yummy! Another great excuse for using my fresh parsley from my pot garden. Don't forget to pick your fresh parsley for the garnish!